Astrological Square:Why are Sagittarius and Pisces incompatible? Why are Sagittarius and Pisces incompatible? I’ve written this post in honour of Saturn in Sagittarius square Neptune in Pisces, but I’ve taken a slightly different approach. With big events like these it can be easy to miss some basic questions which actually help us to understand what’s really going on. In this case the basic question is WHY exactly does Sagittarius square Pisces? Normally when you think of sun sign astrology, the answer is simple: one is fire and one is water- and fire and water don’t go. But if you look at the natal chart, the answer is actually mathematical. I think this is something beautiful in the natal wheel that’s easy to forget. The circular nature of the chart reveals as many secrets as the planets and signs. In the circle 90 degrees is a square aspect, two energies intimately locked in a battle for expression. There’s no easy flow but they can work together. See Pisces squares Sagittarius, but it also squares Gemini. And it directly opposes Virgo. 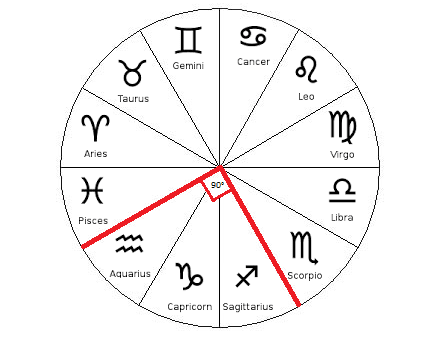 Looking at the circular chart, each mutable sign squares the previous and the next, and opposes the one 180 degrees away. This is the same for any modality group. In astrology the signs can be interpreted as philosophical concepts, the philosophy of the sky. The mutable signs all deal with mutable energy, but they express it in different ways. Similarly they deal with ‘mutable’ philosophical concepts. Believe it or not (it’s your Piscean choice), but all these things are in constant change- that’s why they’re mutable. Gemini is knowledge and facts, Sagittarius is truth and meaning, Pisces is belief and perception, and Virgo is reality and order. But let’s not forget their slightly difficult relationship to each other. What does it actually mean to square, or oppose, something? It doesn’t mean the existence of one thing cancels out the other; in fact when it comes to oppositions they can be almost mutually exclusive and just exist in their own right. Let’s have a look. Say you believe (Pisces) in the afterlife and its true (Sagittarius), it does exist. You can’t reliably collect facts (Gemini) to prove it because you have to die first, and the afterlife is technically not real (Virgo) because reality is something tangible. So here we see that mutable signs can work together, in this case Sagittarius and Pisces. But they can also contradict each other and be incompatible. But this incompatibility doesn’t actually undermine the validity of any other concept. This is how oppositions can be challenging. You may have noticed that in Astro-philosophy, facts and reality are actually mutable concepts and not fixed as some people might believe. That’s because facts, though seemingly set in themselves, have to be collected to draw a conclusion. And the conclusion can alter depending on how many facts you collect. Ask anyone with strong Gemini in their charts – their opinion is so changeable because they are always learning new things every day! Let me give you another example to explain what I mean- I’m not a scientist so let’s not take everything here too literally. Imagine a town where the population is 160,000. Say we take a random sample of 125,000 people and ask them whether they like chocolate. If 60,000 people say they like chocolate, it wouldn’t be unreasonable to conclude that about half the population of the town probably like chocolate, as the sample size is relatively large (I’m assuming they would make this kind of conclusion!). But say we then sample all 160,000 people, and still only 60,000 like chocolate. We’re now down to 38% of the population liking chocolate and so consequently our conclusion has changed! And people’s preferences could change over time too with different experiences. We could keep trying to collect more and more facts to get the perfect conclusion, but ultimately we can’t keep this Gemini-like behaviour up forever as nothing would get done. Remember air is mental, but it is also passive- we need some fire action to move forward now! At some point we need to stop collecting and start concluding to get any real results. So now we have to use our subjective perception (Pisces) of how many facts (Gemini) make something true (Sagittarius) before you can come to a conclusion about reality (Virgo). Consequently our truth is always dependant on experience. And remember, all those elements are equally important. If we only collected facts and never drew any conclusions, the facts have no real meaning; if we keep coming up with truths without ever checking to see if our truths match up with the world, our truths would be meaningless too. So in one sense, even though they can both exist in their own right, oppositions give meaning to the opposite sign by providing balance to the other’s pursuits by demanding an alternative action. As I mentioned earlier, many secrets can be found in the natal wheel itself. To remove one corner of the wheel is to ruin its perfect circular shape – it no longer represents the flow of life. Similarly, if say Gemini is on the ascendant and starts the natal chart: to never progress beyond that to Virgoean, Sagittarian and Piscean experiences is to stay undeveloped and immature. The natal wheel works because it is a wheel (and not ever described merely as a circle). It is always spinning, always moving, like the astrological months we move through. Though we live in a world where Gemini-type knowledge seems to be most respected, the other mutable concepts are equally valid to our experience of being human; which is what mutable energies really represent. They encompass the changeability of humans, our shadow sides and fundamentally unstable nature. No one stays the same forever; all experiences impact and change us. So back to the original question: why are Pisces and Sagittarius incompatible if they both represent expressions of our humanity? Well the answer is – they’re not. Well, not necessarily, but they can be because they have a tricky relationship – a square. If we cast our mind back to the beginning we’ll remember my description of a square between mutable signs. Both energies might be similar, but they operate on different levels which makes them hard to merge. They’re in conflict in a different way to Sagittarius and Gemini. They do not balance each other, but to get from Sagittarius to Gemini on our mutable journey we must pass through the midpoint of Pisces. So their relationship is important, as Pisces plays an important step. But what does this mean for Sagittarius and Pisces? Well we have to look at the concepts that these signs represent. There is tension here because Sagittarius, though moving away from purely tangible ideas, still operates through the realm of the mind, with grand ideas learned through experience. Whilst the energy of Pisces, though also working on a grand scale, operates purely on the unseen, unconscious and collective levels: where personal experience is second to things known on an intuitive basis. The two can come to the same conclusion, but not without compromise to the purity of what the other represents. This is in essence the root of the square; learning compromise. As we can see, by taking into account the action and creativity of fire, the emotion of water, the thought of air, and the logic of earth, astrology is an amazing philosophy of life. Not only providing planets, signs and aspects which can be used to represent in a simple form the vast complexities of human experience; it also reflects our existence back into the universe which created us, and we all know we are made of stars. Designed by Inkhive. © 2019 The Horizen. All Rights Reserved.